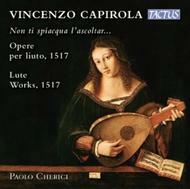 This CD is dedicated to Vincenzo Capirola (1474- after 1548). It is intended both as a tribute and as a testimony: a tribute to one of the most important composers of Italian early sixteenth century instrumental music; a testimony to the transformations that the music language brought to completion in one of the most extraordinary and rich periods in the history of music. In the very first decades of the century, composers begin to write and publish specific instrumental pieces. As a consequence, instrumental music started to emerge from the shadows of the medieval period. This new attention to instruments (such as organ, viola, harpsichord and particularly lute) produced a creative flurry of new forms and languages which characterised all the following instrumental music. Vincenzo Capirola played a leading role in this flourishing phase of instrumental repertoire, thanks to his manuscript dating back to 1517 containing dances, ricercars and transcriptions of vocal pieces of contemporary polyphony. His writing has a strong originality, especially in his ricercars, which have an amazing breadth of composition in the alternation of conflicting moments (such as fast virtuoso scales and slow calm chord successions).